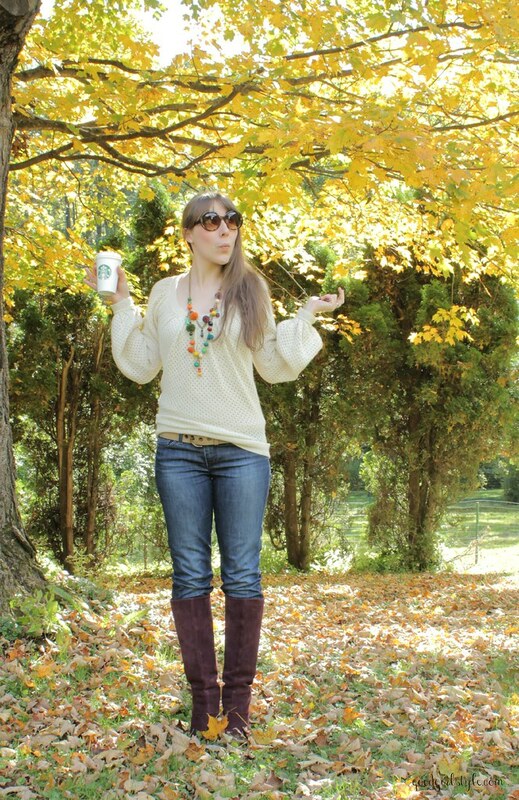 Good Girl Style: Happy Fall! It has been a beautiful first few days of fall here! I love being able to wear my favorite boots and a few layers or heavier materials (such as this lovely alpaca sweater, one of my favorite fall pieces). These are all classic pieces that combine to make an outfit that is both timeless and modern, with the addition of a fun, colorful necklace and some details like wedges and zippers on the boots and bell sleeves on the sweater. I've had the Coach belt since high school! Big sunglasses are always a must, and a Cafe Americano can go a long way towards making a beautiful day, too.